The Brackenbury Residents' Association (BRA) is one of the most active in Hammersmith and Fulham. It seeks to address a range of local issues and has been successfully doing so since it was first set up in 1998. It is currently launching a new tree project which will see the planting of around fourteen additional trees in the area this autumn. As part of the scheme it has also organised for local residents to care for newly planted trees since the beginning of the summer - with some BRA members generously sponsoring additional trees. I'm told that BRA have been working with Gavin Simmons, H&F Council’s long-serving arboraculturalist (tree expert) and tree enthusiast, who has kindly given his help and advice. 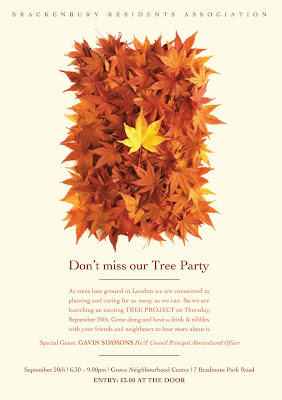 The BRA Tree Project will be officially launched with a Tree Party on 20th September at the Grove Neighbourhood Centre. Tickets are £3 and it begins at 6.30pm. Gavin Simmons will be the Special Guest. See attached for further details. What’s Happening To H&F’s Small Shops? Don’t Ask Us About Our New Fees and Charges!